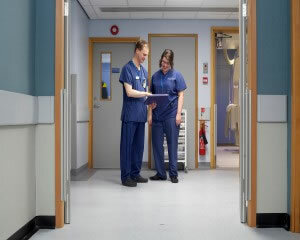 Doors in hospitals suffer more than most from wear and tear resulting from high traffic levels and impact damage from trolleys, wheelchairs and other wheeled equipment. Many hospitals throughout the country are finding that prevention is better than a cure. Intastop have supplied their door protection products for refurbishment programmes on both new and existing fire doors in a number of Britain’s leading hospitals. This course of treatment has enabled hospitals to save large sums of money as their maintenance bills for the repair and replacement of doors have been significantly reduced. The Chesterfield Nuffield Health Hospital, Bristol commissioned Intastop Ltd after its walls in theatre corridors and waiting areas were suffering from high levels of unsightly and unhygienic impact damage. York Teaching Hospital NHS Foundation Trust commissioned artistic wall protection from manufacturer Intastop Ltd after its MRI waiting area at York Hospital was suffering damage from the backs of chairs scuffing the perimeter walls leaving unsightly and unhygienic levels of damage.